“An elegiac memoir and social jeremiad,” Cuz is “a literary and political event like Toni Morrison’s Playing in the Dark” (Henry Louis Gates Jr.). First appearing in The New Yorker, Danielle Allen’s Cuz announced the arrival of one of our most gifted literary memoirists. 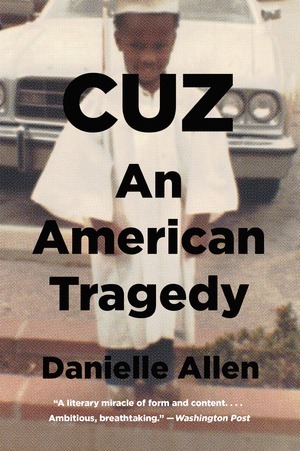 In this “compassionate retelling of an abjectly tragic story” (New York Times), Danielle Allen—a prize-winning scholar—recounts her heroic efforts to rescue Michael Alexander Allen, her beloved baby cousin, who was arrested at fifteen for an attempted carjacking. Tried as an adult and sentenced to thirteen years, Michael served eleven. Three years later, he was dead. Why did this gifted young man, who dreamed of being a firefighter and a writer, end up murdered? Why did he languish in prison? And why at fifteen was he in an alley in South Central Los Angeles, holding a gun while trying to steal someone’s car? Hailed as a “literary miracle” (Washington Post), this fierce family memoir makes mass incarceration nothing less than a new American tragedy.